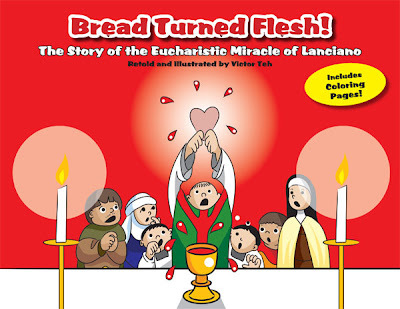 "Bread Turned Flesh! ", now available as PDF eBook, is a delightful retelling of the Eucharistic Miracle of Lanciano, Italy. In the year 730AD, a priest had doubts about the Real Presence of Jesus in the Eucharist. He questioned how bread and wine could turn into the Flesh and Blood of Jesus during Mass. God decided to give him a surprise! Includes coloring pages!